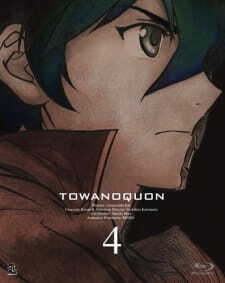 The Towa no Quon series picks up significantly in its fourth outing, with Guren no Shoushin. It improves at least slightly in almost all areas, and manages to be both a philosophically fulfilling and thrilling ride. The naive aspects of the show are more maturely realized here, and feel more like powerful idealism fit for characters battling with their lives. It's not prolific, but it certainly is good enough to entertain. The main themes of this episode have to do with forgiveness and culpability. The battle between the Custos cyborgs and the superhuman Attractors continues on, but it becomes more complicated as one of the main characters is forced to switch sides due to a revelation about the past that causes an unforeseen accident in the present. This brings out all kinds of emotions from the different characters - mistrust, hatred, confusion, disillusionment, even enlightenment. Forced to fully experience the individuals on the other side, our switcher realizes the humanity in everyone present there, and feels great guilt over what has transpired previously. Meanwhile, other members simply can't trust the new addition, and question the judgement of their leader. The movie manages to explore these emotional and philosophical themes in a very nice way. It's never too saccharine or over-stated, and it's deep enough not to feel cheesy or naive. The show feels quite mature, even if the dialogue and exchanges remain simple. These scenes are among the best in the whole show, and lead beautifully in to the explosive ending, which has some of the most dramatic emotions of the series yet. The animation was again stellar, and the backgrounds throughout were very well-detailed and attractive. My slight complaint from the last episode of being too bland in some scenes was answered and then some - there was a lot of color even in the city streets, with bright neon signs dotting the stores. The fight sequences are also very good, with the addition of a new Attractor stealing the show. My only complaint is that Quon was downplayed in the final fight seemingly only to emphasize the new Attractor, and he felt uncharacteristically weak. But this is a minor gripe, as the ending cliff-hanger left me with a sense of anticipation for the sequel. At this point in the series I'm not sure if it would be easy to step in without prior knowledge. I feel like the dialogue and themes are universal enough to be pleasing even to an audience who didn't know the characters, but it would definitely lose some sympathetic impact not knowing how everyone has struggled thus far. But for fans of the first three, this episode will surely not disappoint, and it's definitely the best of the first four to me.